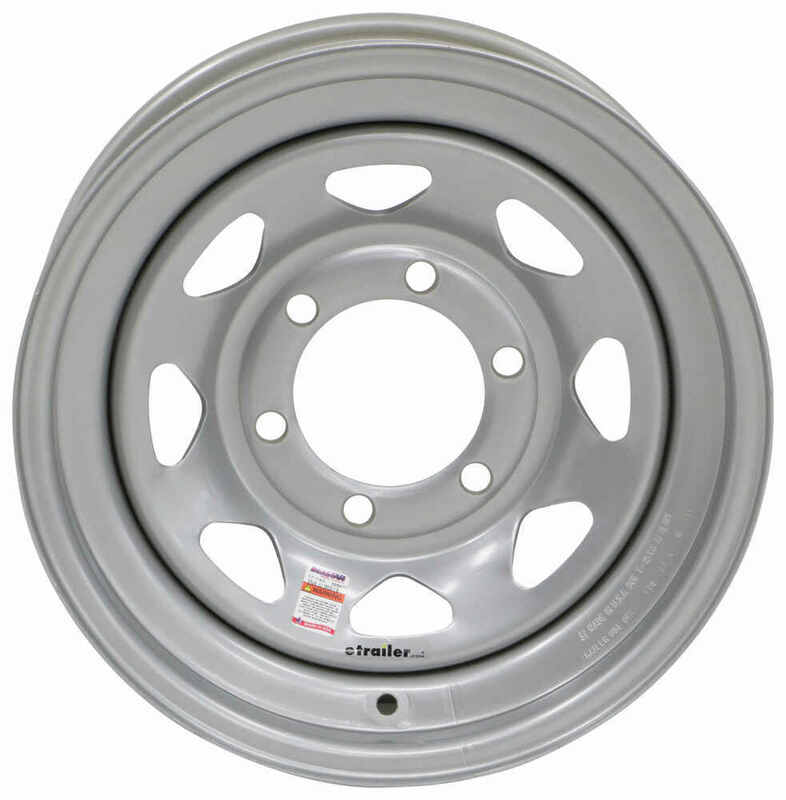 This 15" x 6" steel trailer wheel has a 6 on 5-1/2 bolt pattern and a 4.27" pilot diameter. Rust-resistant Starlite silver powder coat finish. Lowest Prices for the best tires and wheels from Dexstar. 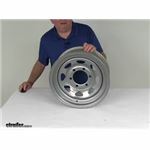 Dexstar Steel Spoke Trailer Wheel - 15" x 6" Rim - 6 on 5-1/2 - Silver Powder Coat part number AM20535 can be ordered online at etrailer.com or call 800-298-8924 for expert service. 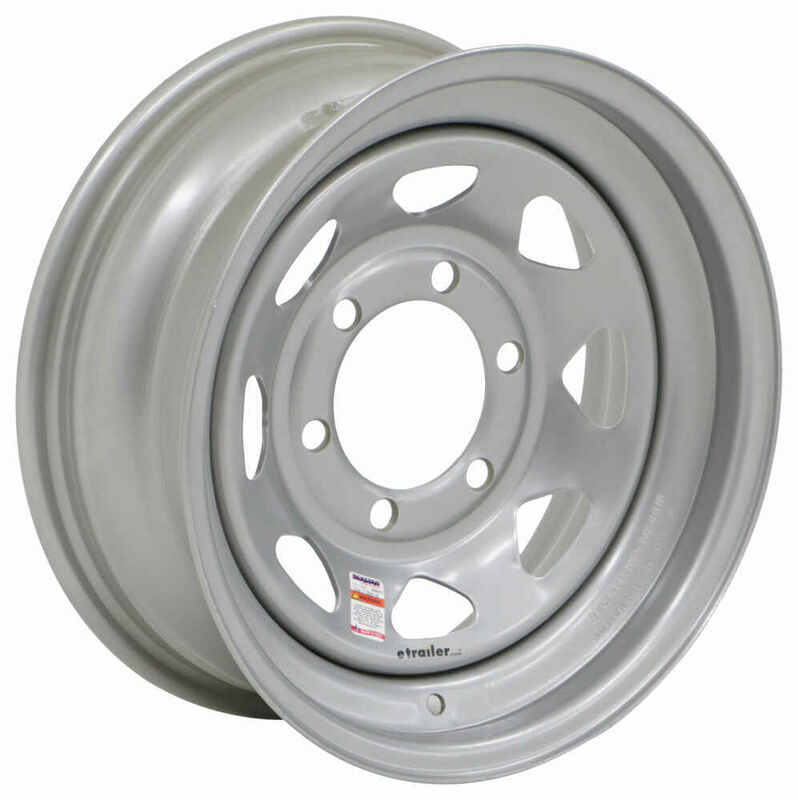 Corrosion-resistant, 15" steel wheel features a 6 on 5-1/2 bolt pattern and meets Department of Transportation standards. Radial tire has a ply rating of 8 and a 2,540-lb maximum load at 65 psi. 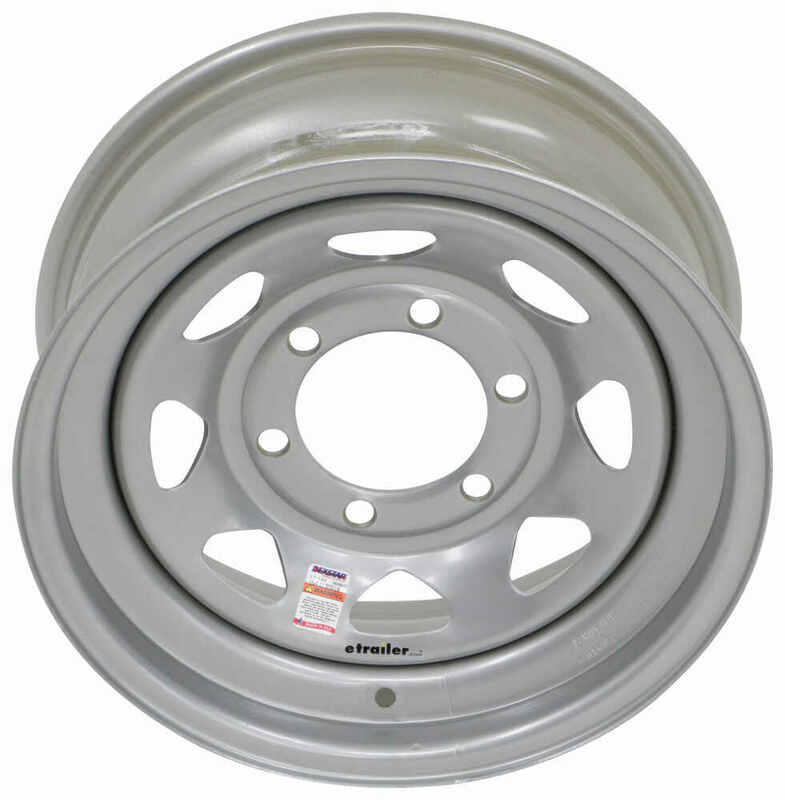 The 15" diameter x 6" wide steel trailer wheel features a 6 on 5-1/2 bolt pattern and a corrosion-resistant powder coat finish. 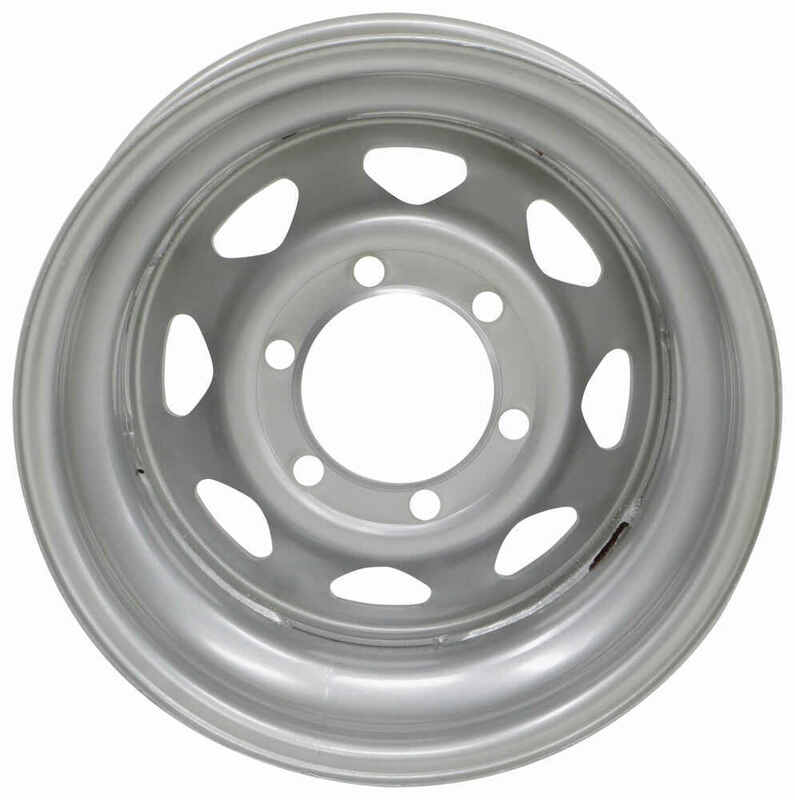 Speaker 1: Today we're gonna take a look at the Dexstar 15" x 6" Silver Spoke Steel Trailer Wheel with the six on 5 1/2" bolt pattern. Now this wheel is a sturdy steel construction. It's a silver powder coat finish over an E-coat primer on the front and the back of the wheel. 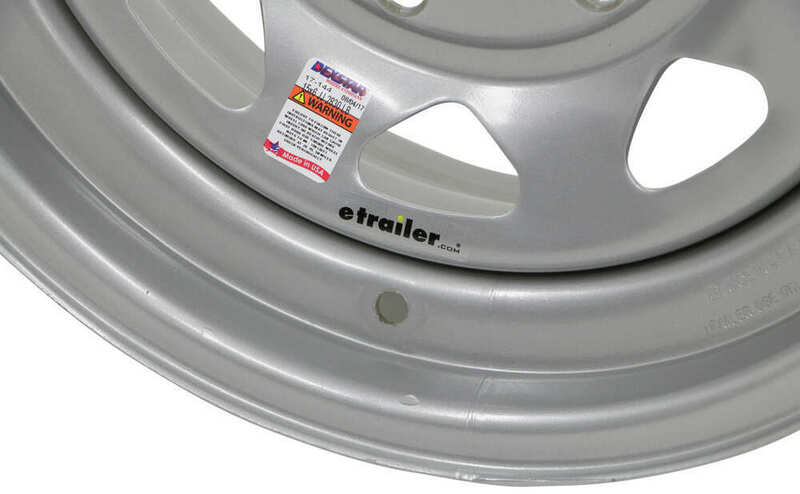 Gives you excellent corrosion resistance.It is your standard eight spoke trailer pattern design. There's your eight spokes. This is high quality wheel. It meets the DOT or Department of Transportation specifications. This is made by Dexstar, which means it is made in the USA.A few specs on this we're gonna measure. The diameter, which is 15" and that's always measured bead-seat to bead-seat, so inside to inside. When a tire is mounted on here, the tire beads would seat right in here, so that's what you're measuring. So if we go inside to inside, take a tape measure here, and there's your 15" diameter.The roof would be the same way, bead-seat to bead-seat, so inside to inside, 6" so 15 x 6" size wheel. The bolt pattern on this is a six on 5 1/2" bolt pattern and it you want to measure that on a wheel like this, it's an even number of lugs, six lugs. All you'd pick is one of the holes and then measure from the center of that hole directly across to the center of the hole right across from it. So again, if we take our tape measure, we go center to center, 5 1/2". So six lug, 5 1/2" bolt pattern. This does use a wheel lug size of a 1/2" inch x 20. The pilot hole diameter, that's this large hole here in the center wheel goes over the hub on your trailer, that diameter is 4.27", and the weight capacity on this wheel is 2,830 pounds.That should do it for the review on the Dexstar 15" x 6" Silver Spoke Steel Trailer Wheel with the six on 5 1/2" bolt pattern. 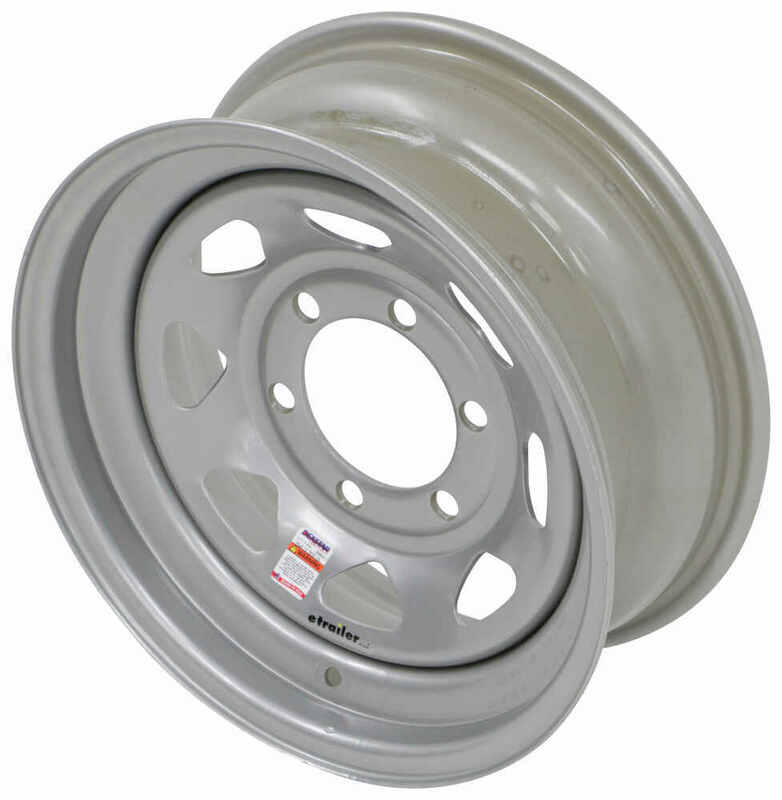 Order: RelevanceNewestRating - High to LowRating - Low to High This 15" x 6" steel trailer wheel has a 6 on 5-1/2 bolt pattern and a 4.27" pilot diameter. Rust-resistant Starlite silver powder coat finish. The 15x6 inch wheel # AM20535 will accept 205/75-15 tires, 225/75-15 tires, and 7.00-15LT tires. I have linked the 15 inch tires we carry for you. For a valve stem you can use # AM20904. 6 on 6 inch is not a standard trailer bolt pattern so we won't be able to get that for you. The closest would be a 6 on 5-1/2 inch bolt pattern 16 inch wheel like the part # TTW660655SM1. If this is a trailer application most likely this is the bolt pattern you need. I attached a help article on determining bolt patterns for you to check out as well. 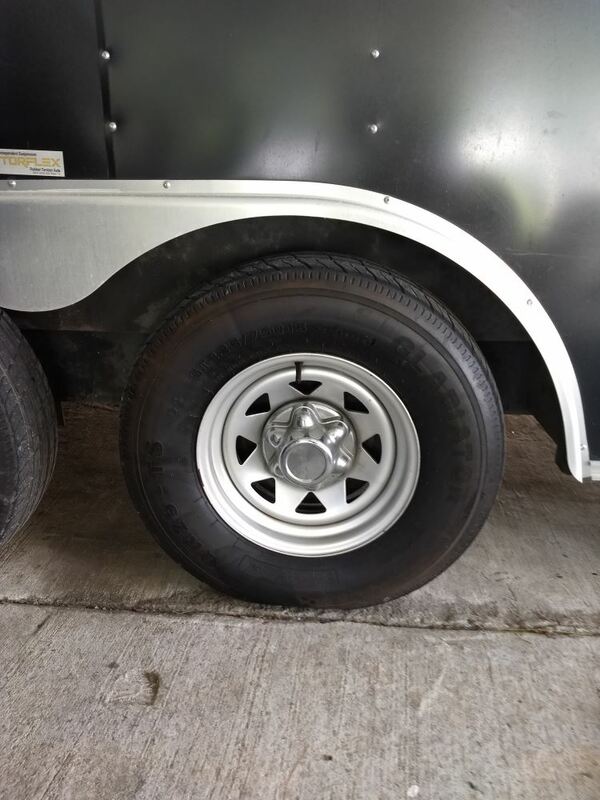 We have an aluminum trailer wheel that is 15 inch in diameter, 6 on 5-1/2 inch bolt pattern, and pilot diameter of 4.25 inches, part # TTWAL0614545S. Or for a steel one that matches all of the same criteria we have the part # 560655SM1 this is a mod style wheel though. Yes, a center cap like what you have that measures 4.25 inches in diameter would fit the wheel part # AM20535 that you referenced. It has a pilot diameter that is 4.27 inches in diameter so it would fit well with a 4.25 inch cap.